Nestled among the secluded foothills of the Gold Coast Hinterland lies a holiday home unlike any other. From the moment you arrive on the spacious grounds of the Hamptons Hinterland Retreat, you’ll feel a sense of tranquility and privacy like never before. And yet everything you need is within easy reach. A short 20 minute drive east could see you kicking up your heels in lively Surfers Paradise, enjoying fine dining in Broadbeach, or feeling the sand under your toes at famous beaches like Currumbin or Burleigh Heads. Dreamworld, Movie World, Wet’n’Wild and the Australian Outback Spectacular are only 20 minutes north. If shopping is your thing, you’ll appreciate being a stone’s throw from the largest shopping centre on the Gold Coast, Robina Town Centre. Or enjoy a round of golf at any of the five golf courses located just down the road. Local supplies are a convenient five minute drive away at the Worongary Shopping Complex, offering a supermarket, several coffee shops, pubs, restaurants, and bottle shop. 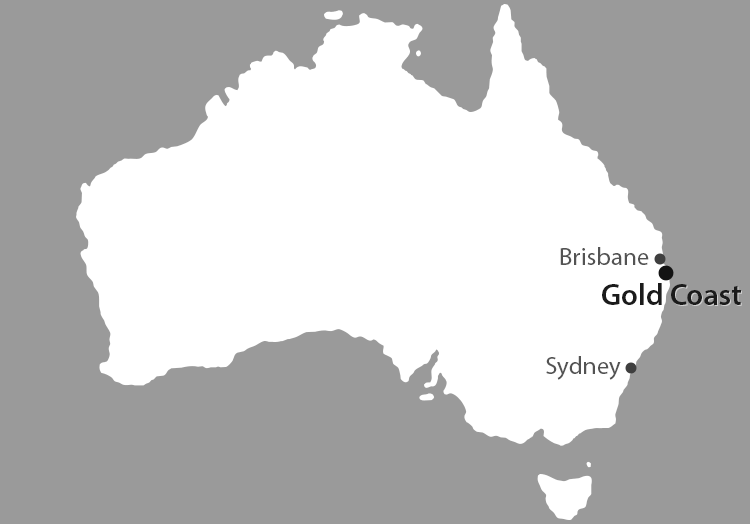 The Gold Coast Airport is only 20 minutes south of the Retreat, with Brisbane Airport approximately 1 hour away.